For all investors seeking income, I have some bad news for you. US Treasury notes and bonds will eventually yield nothing. That’s right, I said it. “Zero percent interest coupons”. Many pundits would argue the opposite. And yes, the argument for higher interest coupons in the future is valid and sound. The US is currently following a strategy of debt destruction such that as I write, the nation is closing in on $13.5 trillion in debt. To see the number is quite startling. It is: $13,500,000,000,000.00. Mercy! The number is so large, most calculators can’t account for all the numeric placeholders. The number is so large, we now round up by hundred billions. The number is so large, the late astronomer, Carl Sagan, referred to really large numbers as “billions and billions”. The good news is that there appears to be a limit. Zimbabwe wrote the book on trying to print their way out of economic dysfunction and eventually stopped printing with a z$100 trillion bill. As we all know, a printing press that never stops promotes inflation that eventually makes the printing press irrelevant. Not long after the introduction of the z$100 trillion, Zimbabwe thought about introducing the z$1 quadrillion bill. But, I suppose they reconsidered due to the idea that it would take too long to make change at the McDonald’s drive thru. Actually, by the time they got through destroying their economy, a z$1 quadrillion bill would not even buy a Big Mac! Have we not learned anything! Actually, we have. When I say ‘we’, I mean our very own US government – the Federal Reserve. They have learned how to manipulate. Any party that issues a massive amount of debt, and continues to do so month after month, should logically expect to pay higher interest rates. One, the issuer is constantly increasing supply and diluting value and two, lenders eventually become suspicious that indebtedness leads to bankruptcy which leads to default. Point well taken. However, this is the new era. Here is what I think will happen to Treasury yields. Debt is borrowed money and there are two factors at play in the process. One, the borrowed money has to be repaid. Two, lenders, or buyers of the debt, are typically not willing to lend money for free. They want an interest coupon that is commensurate with the risk of the return of principal. The first issue in the debt process is the return of principal. The Federal Reserve and the European Central Bank have both said, and demonstrated over the past year or so, that they are committed to printing money to keep their member banks afloat. Whether they physically produce the currency or they electronically create credits on a balance sheet does not matter. Credit expands the money supply because it allows for leverage in borrowing. Why haven’t the Fed and the ECB failed like the central bank of Zimbabwe? Because the stuff that the Fed and the ECB produce as currency has some value and purpose whereas the Zimbabwean currency did not. For instance, several years ago, Zimbabwe owed the IMF several hundred million dollars in a loan repayment. To repay the loan, the Zimbabwean central bank ran off tens of billions in Zimbabwean currency (due to the exchange rate at the time), bought enough US dollars (the loan was payable in US dollars), and repaid the loan. I don’t know what happened to the Zimbabwean dollars but if the bank that exchanged the currency is still holding them, they are probably trying to sell them as novelty items on eBay. They are a total loss. For a currency to be in demand, it has to have a purpose. I think we all know by now that all currencies in circulation today are fiat currencies. The currency has no real value. However, the US dollar has a purpose. Even though the US produces just over 5% of the world’s oil supply, oil is traded in US dollars. So are most commodities. If investors want to buy commodities, they have to have US dollars. Interestingly enough, if they want to buy US Treasuries, they also must have US dollars. Paradoxically, the more the US sells debt, the more demand there is for the currency. With the promise of the perpetual printing press, the return of principal is a guarantee. What the principal will buy in the future is another story. Let’s save that discussion for another day and concentrate on the interest coupon. Why will US Treasury yields all eventually reach near zero? Reason #1: In 2008, the US had $12 trillion in debt and in $2009, $13 trillion in debt. Again, I’m rounding by hundreds of billions. In 2008, the Treasury reported that the average interest coupon was 3.4%. In 2009, the average interest coupon was 3.1%. Do the math. The interest owed in 2008 was $408 billion and the interest owed in 2009 was $403 billion. The result is, even though the debt increased by a trillion, the interest owed went down $5 billion. To illustrate the impact of falling interest rates, a $20 trillion dollar debt financed at 2% would yield just $400 billion in interest. According to the Congressional Budget Office, the US took in $2.5 trillion in revenue in 2008 and spent 8% of that in interest payments. 2.5 trillion times 8 percent equals $200 billion. Now take $20 trillion in debt (most pundits see us there in less than 10 years) and finance it at 1%. The interest payments would equal $200 billion. If tax receipts stay at least steady, the US can continue to pile up debt as long as interest rates fall. Do you feel me? Reason #2: US Real Estate. According to the Fed, US property owners owe over $13 trillion dollars on mortgages. According to Barry Ritholtz, at the end of Q1, 2010, there were 41.6 million mortgages (I’m rounding). Do the division and you get about $312,500 per mortgage. We know that about 25% of mortgages are underwater and we know that about 10% will default this year. Negative equity statistically raises the probability of default. I think we would all agree that this is a vulnerable group. So, if we have 11.9 million mortgages in danger, multiply that by the average mortgage of $312,500 and you get $3.7 trillion in precarious loans. How can ultimate default be avoided? Simple. The median home price in the US is around $200,000. Using a Bank Rate calculator, a 5% interest rate gives the borrower a $1073 monthly payment for 30 years and a 2% interest rate gives the borrower a $739 monthly payment for the same period. The lower interest rate makes the mortgage more affordable and it also makes it more competitive with comparably rented property. In addition, allowing the rest of the mortgage debtors to refinance at 2% would be an economic stimulus in and of itself. The deal with the banks is simple. Accept 2% mortgages and lose $400 billion or so ($13 trillion times 5% versus $13 trillion times 2%) or risk losing over $3 trillion by default. There is no other way out of the real estate credit bubble. Or, maybe we should ask Alan Greenspan if he has a better idea? Interest rates have to fall. Besides, any bank losses will be made up by the Fed stealing the money from the tax payers and giving it to the banks. They call it ‘STEALING’. Uh,…, I mean, ‘TARP’. Reason #3: The stock ruse. To keep the illusion of prosperity alive, stocks have to rise. If bond yields were at zero, there would be less competition for the money needed to drive stocks higher. Also, it would not cost anything for corporate America to borrow so financing expenses would fall thus aiding the bottom line. A common lie today is the idea that corporate America is flush with cash. While they may have some cash on hand, corporate America also has more debt than ever – some $7 trillion. Wouldn’t they like to roll that over at a cheaper, or perhaps zero, interest rate? Reason #4: The amount of debt is no longer an issue. Sovereign debt itself no longer matters. What matters is the interest coupon. The debt can be securitized and then sold over and over and over for commissions. Goldman Sachs no doubt stands ready to help out. There are many buyers like pension plans that need a source of steady interest income. The debt can morph into derivatives backed and supposedly insured by credit default swaps. The swaps guarantee the interest income from the sovereign debt issuer. The new leaders, like the Obama group, insure the interest payments on the debt by raising taxes on things like health care, financial industries, business, the environment (cap and trade), the ‘rich’ (people with jobs), and so on. The debt can grow and grow as long as the interest payments are met. Lowering interest coupons can help immensely. Perversely, as more debt is issued, more derivatives and swaps have to be created and sold. Three-quarters of all swaps are interest rate swaps and they are underpinned and financed by ownership of US Treasury notes (if they are underpinned at all). So the more the debt rises, the more swaps are needed, and the more Treasuries are bought. Debt doesn’t matter. The payment on the interest coupon is all that matters. Zero percent interest coupons make the amount of debt even more insignificant. Reason #5: Foreign trade. China has announced that they have passed Japan as the second largest country in the world in terms of GDP. They got there on the insatiable desire of US shoppers to run to the store at every opportunity and buy the cheapest piece of crap they can find with money they don’t have. China and Japan both claim the US as their biggest recipient of exports by far. China and Japan are both two of the biggest buyers of our debt. Yes, they have to ‘repatriate’ the currency but more importantly, they have to worry about our interest rates as much as we do. Debtors don’t worry about ownership. They simply worry about monthly payments. As long as US interest rates stay low, we can continue to borrow and make the minimum payments. If interest rates were to rise, half the boats in the Pacific Ocean would have to return home. China and Japan will keep buying until we no longer amuse them. Reason #6: Chips don’t pay interest. Part of the plan of the ruling illuminati is to completely control currency. They have to convince the peons that inhabit the land and toil to produce an economy that they should use and rely on a currency supplied by the illuminati. The Federal Reserve has managed to eliminate the US currency and replace it with ‘Federal Reserve Notes’. In essence, they have reproduced a Las Vegas gambling type of environment where the peons surrender their money at the door in exchange for chips. The chips are the only ‘currency’ allowed in the casino. The chips are of course pieces of plastic (probably manufactured in China) and they are in reality, worthless. They have an illusional value in that they are assigned a value by the casino operator. This has several purposes. First, the chip for money exchange serves to psychologically separate the peon from the value of his money. Chips can be leveraged and credit in chips does not hold the same importance as credit in real money. Two, the casino controls the chip supply. You can stay in the casino for a year and a five dollar chip will still be a five dollar chip. It will not earn an interest coupon. Treasury bonds are now ‘chips’. Investors used to buy them for interest income but not anymore. A 10-year Treasury note currently yields less than 3%. The US dollar is down 15% or so versus a basket of currencies in the past 10 years. If the next 10 years is like the last 10 years, investors will lose 12% on an investment made today. This is not an investment. 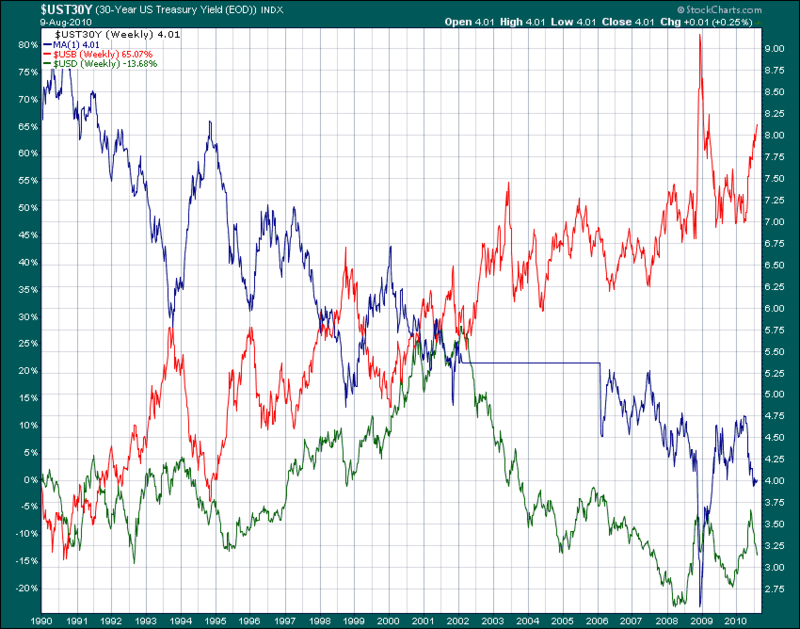 Rather, Treasuries are now chips in that they are tools of the casino. They are tools of manipulation. They are bought to manipulate interest rates lower. They are bought to manipulate trade imbalances. They are bought to propagate credit default swaps. They are bought to extend the plague of debt. They are bought to leverage an economy duped by the illusion of wealth. Chips don’t pay interest. Neither will Treasuries. Reason #7: The end game. The goal of the ruling illuminati is ultimate goal of every business. That goal is to produce a product at zero cost and sell it to idiots that don’t realize the product is worthless. Once the illuminati seized the government from the nitwits that the halfwits elected, they worked to indebt the government. Who buys government debt? Banks. Who makes money from debt? Banks. Who controls the banks? The central banks – the Federal Reserve and the ECB. Do they make more money if the debt is repaid or if it is perpetually extended? Now I think you feel me! Since the central banks now control the governments, they can start the process to bring interest rates to zero. This will allow the central banks and their shill banks to produce their currency at zero cost, borrow their currency at zero cost, and lend it to the peons at something much higher than zero. That gives them 100% profits. Reason #8: Debt perpetuates the illusion of wealth. US household net worth has fallen $17 trillion since the onset of the 2007 recession. That ‘net worth’ figure includes residential equity that in reality, would be much lower than estimates given price disintegration of properties that were actually sold in the period. The point is that household net worth lost 25% in two years. The debt assumed by government, both federal and state, has merely served to artificially inflate current conditions to carry on the illusion of wealth. While all the idiots of the world blow the trumpet of ‘recovery’, they don’t realize they are blowing into a violin. There is now a different instrument in play and there will be no ‘recovery’. The economy, rather, is in a transformation stage and it does not need more debt. The economy is forever structurally changed just like it was in the industrial revolution or the silicon revolution. Debt is an unnecessary expense that cannot be used by the private sector. There is no use for the extra money. The economy has entered a period of demise instigated by currency value destruction, wage contraction, and asset deflation. The result is that the interest coupon on government debt is doomed to zero. If a 10-year Treasury offered a 10% coupon, the government of issuance would soon be in bankruptcy as it would be impossible to produce better than a 10% return on the borrowed money. So, the government might as well eliminate the coupon since it, the Federal Reserve, the Fed’s shill banks, and the countries that depend on the US living beyond its means – China and Japan – have the sole responsibility of soaking up the bonds and notes until the yield gets to zero. The illusion is all that matters. Reason #9: The Federal Reserve is a ‘for profit private bank’. In its portfolio is more than $5 trillion in Treasuries (as of Q1, 2010). China and Japan each have nearly a trillion as well. How does the Fed raise the Fed Funds rate? They sell Treasuries. Selling now is not an option. How do they lower the Fed Funds rate? They buy Treasuries. So let’s see. If the Fed wanted to make sure that it, its shill banks, and its ‘always keep interest rates low’ conspirators, China and Japan, make lots of money on their Treasury purchases, what should they do? Just I write, the Fed announced that they would buy more Treasuries. That’s the ticket, my friends! All aboard to zero! I think Bernanke feels me! Reason #10: The ‘death cross’. A lot of people have written about the bearish ‘death cross’ concerning the 50-day and 200-day moving average on the S&P 500. When the 50-day crosses below the 200-day moving average, it is considered very negative. Of course, as soon as Benjamin Shalom Bernanke heard about this event, he ordered his minions down at the NYSE to goose the indices. And so they did. But I consider another ‘death cross’. The chart below shows the 30-year US Treasury bond price, 30-year US Treasury bond yield, and the US dollar over the past 20-plus years. The real death cross occurred in 2001. Here’s what is interesting. We all know that to buy Treasuries, one must have US dollars. So, it makes sense that prior to 2001, the US dollar appreciated with bond prices and the opposite was true of the bond yield. Something significant happened in post-2001. 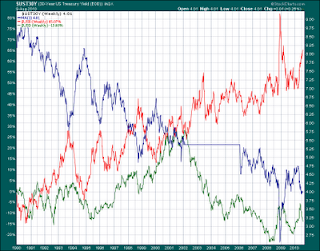 Ever since, the dollar has moved in tandem with bond yields and inversely with bond prices. (The horizontal line in the bond price was for the few years when the government did not issue the maturity.) What does this tell us? I believe the message is simple. The economy has experienced a fundamental change. A true depression has been trying to metabolize. The government has attempted to circumvent the natural business cycle by inflating and manipulating the components of measurement. A declining dollar fuels inflation. Gold observers would note that 2001 was the launching year for gold’s furious run higher. Now the government is trapped by its own game of intervention and debt. If the Federal Reserve would cease and desist its dysfunctional and incestuous Treasury purchase program and allow capitalism to function, the likely result would be for Treasury prices to fall, yields to rise, and eventual currency recovery bringing real support to asset prices. But doing so would crush the institution of the central bank and this will not be allowed by the illuminati. What happens when we get to zero? Either we then come to our senses and adopt intelligent policy or we expire. With the de-evolution of human intellect accelerating at warp speed, prepare for a hard landing!